A 12-year old bug hunter was awarded $3000 from the Mozilla Foundation after he discovered one of the arbitrary code execution, which is detailed as a buffer overflow and memory corruption issue, in Firefox. The flaw has been identified as CVE-2010-3179 which can occur using the document.write() function. So what does the bug actually do? The bug when infected in the users PC, tricks potential victims by visiting a special web page which crashes the browser and allows the attacker to execute malicious code on the users computers. Security researcher Alexander Miller reported that passing an excessively long string to document.write could cause text rendering routines to end up in an inconsistent state with sections of stack memory being overwritten with the string data. An attacker could use this flaw to crash a victim’s browser and potentially run arbitrary code on their computer. 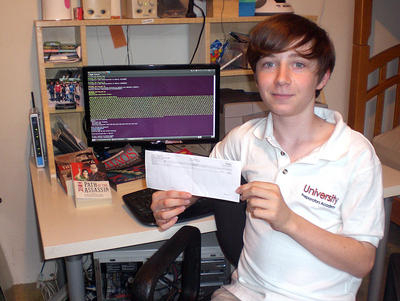 However, this security researcher is just a 12-year old boy who is in his seventh grade and was also awarded with a check worth $3000. Miller has been researching on bugs since Mozilla announced the reward program earlier this year. He has been glued to his PC trying to locate bugs and get paid for it. Miller spent 90 minutes a day for 10 days to find the vulnerability. Miller was really excited to discover the bug and get rewarded. He plans to spend some money to buy a new computer and Christmas gifts for his family, as well as he also made a donation to an animal rescue organization.